Twenty years after her father, Seattle climbing legend Scott Fischer, died on Everest, Katie Rose Fischer-Price traveled back to the land that claimed him—and found herself in the midst of an even greater catastrophe. She was in the bathroom, shortly before 1pm, when the narrow, third-story hotel room began to sway. A tiny fan tipped off its nightstand perch. Above, a small ceiling crack grew, and then grew some more. Time slowed and Katie Rose Fischer-Price, a 24-year-old psychiatric nurse from Seattle, braced herself in the bathroom doorway. Outside the Tibet Guest House the earth was having its way with Kathmandu and the rest of Nepal. The city wretched with every pulse of seismic energy, a deafening echo of metallic booms rolling in like a waterfall of slamming garage doors. Then, just as suddenly, it stopped. But the ground beneath her feet, she knew, couldn’t be trusted. Seventeen days earlier, a magnitude 7.8 earthquake had taken 8,857 lives and reaped nearly $10 billion in damage. Today, May 12, 2015, was that earthquake’s magnitude 7.3 encore. Outside she found a handful of friends, including Neena Jain, an American disaster relief doctor. With more aftershocks likely on the way, they knew they needed to get far away from the city and its crumbling buildings. Now. As they wound through the streets, choking on dust, teetering brick and rebar loomed on the edge of collapse. Since that first quake many in Kathmandu, their homes irreparably damaged, had been living in open air. Now citywide panic manifested itself in screams. A woman pulled Fischer-Price aside and started screaming, not at her, but at someone, anyone. Not again. How can this be happening again? Katie Rose had come to Nepal, to the foot of the highest peaks on the planet, to connect with the country and people her father, the late Scott Fischer, had long admired. The legendary mountaineer perished at the top of the world in the infamous 1996 Everest disaster when Katie Rose was just five years old—one of eight casualties caused by a freak storm in the mountain’s infamous Death Zone. Katie Rose’s plan was to help establish a first response network in the remote reaches of the Khumbu Valley, but now the forces that once created Nepal’s towering peaks had their own plans. As night fell over the capital city, Katie Rose and the group, carrying passports, cameras, a change of clothes, and a plastic tarp, staggered into a field of refugees outside of town. They huddled together on the salvaged tarp. The ground trembled with aftershocks, and Katie Rose listened as the night stirred with more far-off screams in the darkness. She was now bound to this place, she realized later, by two disasters two decades apart. By the time the sun rose and the earth declared momentary cease-fire, she had already made up her mind about what she’d do next. 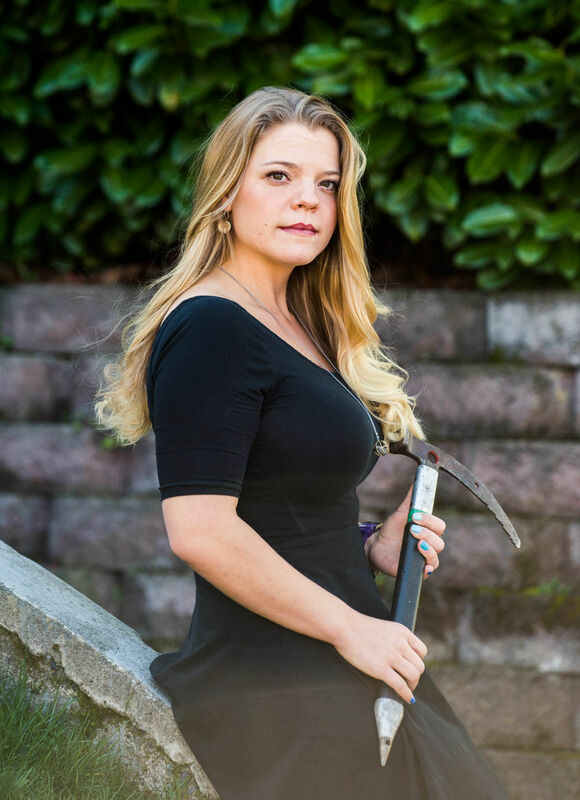 Katie Rose Fischer-Price with her father’s ice ax, at her Seattle home, March 17, 2016. Some 50 climbers were on Everest on May 10, 1996. (Yet another Seattleite, postal worker Doug Hansen, was on his second summit attempt.) Fischer was there with Mountain Madness, his West Seattle–based mountaineering company, to lead eight clients to the top, including accomplished mountaineer and Manhattan socialite Sandy Hill (then Sandy Hill Pittman). 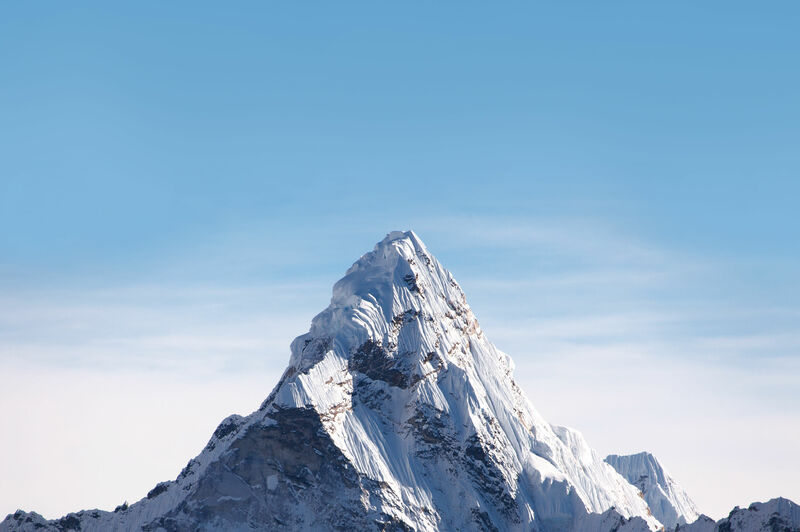 Fischer had summited Everest in 1994 without supplemental oxygen—an incredibly challenging and potentially deadly prospect at altitudes higher than 26,000 feet—as part of the first-ever Everest cleanup crew (a crew responsible for the removal of 5,000 pounds of climber trash). In the decades before, he tagged the Matterhorn, Aconcagua, and a host of impressive mountains throughout the Himalayas, including K2 and the first-ever successful American ascent of Lhotse, the world’s fourth-highest peak. Before the age of 40, he had stood atop the tallest peaks on six of seven continents (only Antarctica’s Vinson Massif eluded him). Before the age of 40 Scott Fischer had summited the tallest mountains on six of the seven continents. During that time he turned his passion for climbing into a livelihood with Mountain Madness, guiding people to the highest points on earth. But it wasn’t what Fischer climbed that earned him acclaim in the mountaineering world, it was how he climbed. “There is no one that was more fun to be with in the mountains than Scott,” says Brent Bishop, a Seattle climber and part of Fischer’s team on his successful ’94 Everest bid. Fischer assailed mountains, as Bishop notes, “in good style,” finding joy in the delicate high-altitude dance and performing each of his personal expeditions without oxygen as a way to fully embrace the challenge. Mountaineering was a chance to test the human body and mind for the introspective yet quick-smiling blond, but also an excuse to meet new people and see new places. Much of his legacy, in fact, was built on the lasting relationships with the cultures that thrived in the high alpine. Fischer and his guides, Neal Beidleman and Anatoli Boukreev, successfully brought six of their eight clients to the summit on May 10, 1996, but during the descent they were caught high in the Death Zone (the terrain above 26,000 feet) by a massive blizzard. While his guides and clients eventually descended safely, Fischer, who had become increasingly ill while shuttling climbers to and from camp, was unable to make it below the Balcony at 27,395 feet, eventually succumbing to hypothermia and becoming one of eight to perish in the deadliest 24 hours on Everest up to that point. Fischer’s good friend and business rival, New Zealand team leader Rob Hall, also died in the storm, marking the first time that two party leaders died in a single event on Everest. Both men’s bodies remain on the mountain to this day. Katie Rose remembers his hands—the strong appendages that led him up some of the most impressive rock faces, glaciers, and peaks on earth—but she never joined them on a trek up Mount Rainier or watched them cut into a birthday cake. 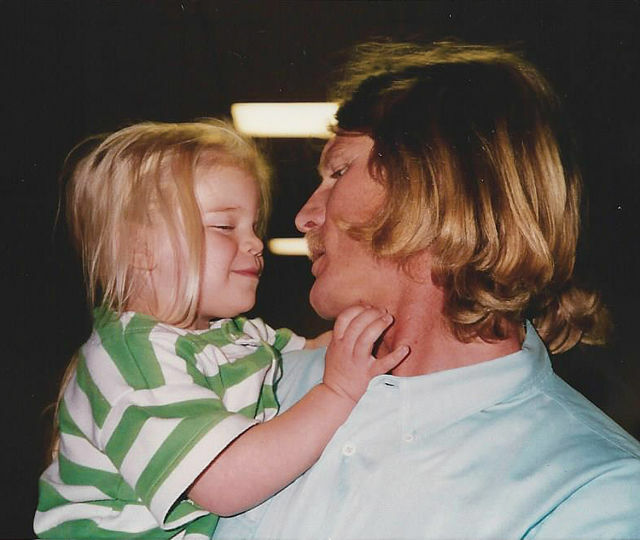 Twenty years after his death, Katie Rose only remembers her father’s hands. Unlike the decades-long media circus surrounding that fateful ’96 climb, Katie Rose was never much interested in her father’s final hours (“It’s been picked apart to death, and everyone has their own perspective”), yet her curiosity over his life has continued to burn. After high school, Katie Rose attended the University of Washington and enrolled in UW’s School of Nursing. Scott’s friends always talked of him instilling self-empowerment in those around him. Through nursing, Katie Rose hoped she could do the same for her patients. Her curiosity about her father also manifested in a job at Mountain Madness, now run by one of Fischer’s former guides, Mark Gunlogson. Katie’s outgoing nature was a bit of a departure from Scott, says Gunlogson, but her easy laugh and ability to make everyone feel welcome were right in step with her father. She visited Nepal for the first time in 2011, volunteering at an orphanage near Kathmandu and meeting, for the first time in person, Dawa Geljen Sherpa, one of her father’s good friends and most trusted Himalayan Sherpa. Dawa Geljen introduced her to Classrooms in the Clouds, his nonprofit that builds and renovates schools up and down the Khumbu—an idea he’d once shared with her father on one of their high-altitude expeditions. Dawa met Scott Fischer while serving as a lead porter on a 1990 expedition to Baruntse. During early mornings and evenings on that climb, the two shared hot meals and stories from home and promised to stay in touch after the expedition. Together they topped Ama Dablam, Broad Peak, and a handful of other mountains over the next half decade. Fischer even asked Dawa to join him for the ’96 Everest expedition, but the young Sherpa couldn’t skip his work with another guiding company. Photos from Fischer’s camera are the only photos in Dawa’s house in Lukla village, the highest major town along the base camp trek. Sitting proudly in the family’s glass display case, the snaps from a ’93 expedition to Ama Dablam include the Sherpa, his wife, and two young daughters, along with a grinning summit shot of two good friends from two different worlds. Dawa helped start Classrooms in the Clouds in 2007. Since then, the organization has built 24 classrooms, sponsored eight teachers, and built the area’s first computer lab. When he met Katie Rose in 2011 he saw pieces of Scott that he thought had died with his friend decades before. When Katie Rose and her family were approached by U.S. and New Zealand filmmakers in the summer of 2014 about a documentary recounting her father’s last climb, Katie wavered. People had tried to tell Fischer’s story before. Into Thin Air, the Krakauer book largely accepted as the official script for the ’96 climb, questioned Fischer’s judgment as team leader—claims publicly disputed by Fischer’s lead Sherpa, Lopsang Jangbu Sherpa, and guide Anatoli Boukreev. The resulting film by the IMAX crew on the mountain that day cut him out completely. Finally, an Everest movie set to debut in the fall of 2015, featuring Jake Gyllenhaal as Fischer, would add an element of Hollywood to a man who was anything but. Now the documentary, Return to the Death Zone, would bring Katie Rose, Andy, and their mother Jeannie up to Scott’s chorten (a traditional rock memorial for fallen climbers) and Everest Base Camp that spring for the first time. “We were a bit hesitant because that base camp trip was going to be really emotional,” says Katie Rose, “and now we couldn’t experience that moment of authenticity without a camera.” Jeannie decided not to participate, but Katie Rose and her brother had always promised to make the trek together, and when the filmmakers offered to pay for their trip in full in May 2015, they couldn’t walk away from the opportunity. The siblings agreed that their base camp trek should be dedicated to Dawa’s work with Classrooms in the Clouds—they had stayed in touch with the Sherpa via email since meeting him on their first trip to Nepal—and raised about $2,000 for his cause through late April 2015. When the earthquake struck Nepal on April 25, Katie Rose and Andy were six days from embarking on their trip, tracking down passports and texting through final preparations. Thirteen time zones away, half of the documentary crew was high on the world’s tallest peak, just above an avalanche that killed 21 at Everest Base Camp—the deadliest day in Everest history (the 1996 event had previously been eclipsed by a 2014 ice fall that took 16 lives). Overnight the quake crippled an entire country. The documentary quickly became an afterthought. Yet, just when it looked like the trip was done and buried, Katie Rose and Andy’s inherited mountaineering community stepped in. Days after the quake, the Crowdrise fund jumped from $2,000 to nearly $12,000. People showed up with envelopes of cash to be delivered to Nepalese guides, families, and friends. Social media circles now saw Katie Rose and Andy as a bridge between Seattle and the afflicted. The two had a decision to make: Accept this mission or back away. 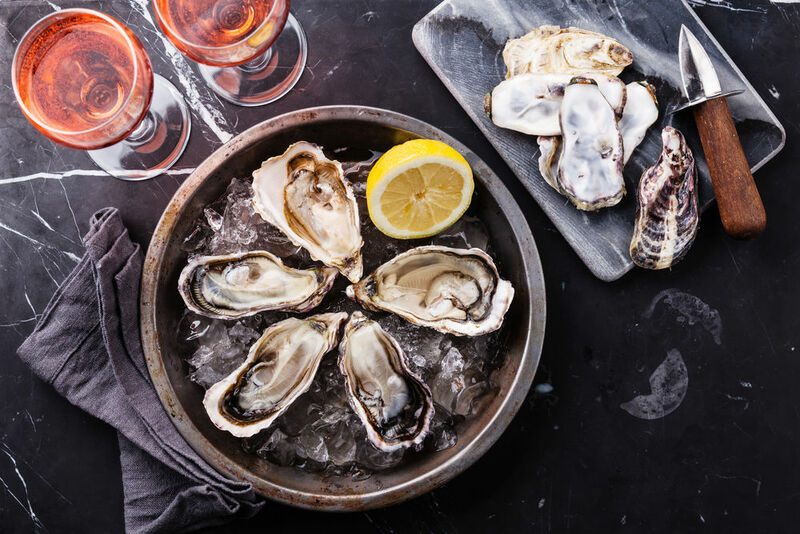 After a few days of deliberation, Andy made the difficult choice to stay put, feeling that his rush to aid could ultimately deplete the precious resources of those he had originally set out to help. As a nurse, Katie Rose saw her call to action. Since graduating from UW in 2014, she had spent over a year working in Harborview’s psychiatric ward, treating the many forms of traumatic stress in the wake of tragedy—a specific skill set that was now in high demand in Nepal’s natural battle zone. Gunlogson, the current Mountain Madness owner, linked her with Neena Jain, an old climbing client and director of a Colorado-based aid organization, Embolden Alliances. The ER doctor, who had previously done relief work in Haiti, Indonesia, Pakistan, and Nigeria, was already on the ground in Nepal; she promised to connect with Katie straight-away. Dawa had also reached out, letting the Fischer-Price clan know he was okay and offering to wait for Katie Rose should she still choose to come. She bought her $952.19 plane ticket from the documentary company (which has put production on hold indefinitely). On May 1, 2015, laden with donated tarps and kids’ clothes from Mountain Madness, she boarded a flight to Los Angeles, then to Dubai, and arrived at Kathmandu’s Tribhuvan International just eight days after the first earthquake. Two earthquakes in the spring of 2015, just 17 days apart, ravaged Nepal, killing nearly 9,000 people and leaving some 3.5 million homeless. Days later, as she sat among the huddled crowd in the field outside Kathmandu the night after the second quake, Katie Rose knew her trip was over. But as the sun rose, a stranger offered her and Dr. Jain a cup of tea, and the little girls next to them started laughing and playing with their hair in between smiling for photos. These small acts of resiliency in the face of disaster were the unspoken confirmation Dr. Jain and Katie Rose needed to return that fall with a plan. Katie Rose had introduced Dawa to Dr. Jain, and the three were already planting the seeds for Classrooms in the Clouds’ newest initiative: a community-led medical relief network in the intricate and isolated folds of the Khumbu. In Nepal, a full quarter of its population subsisting below the poverty line, medical care is a privilege in short supply. The earthquakes threw these conditions under a painful human microscope, as entire valleys were cut off from medical services for weeks. It’s likely no one will ever know how many preventable casualties—from bleeding, broken bones, infection—occurred during those periods, but by arming villagers with basic medical knowledge, Katie Rose, Dawa, and Dr. Jain saw an opportunity to give these areas a chance the next time the ground started shaking. 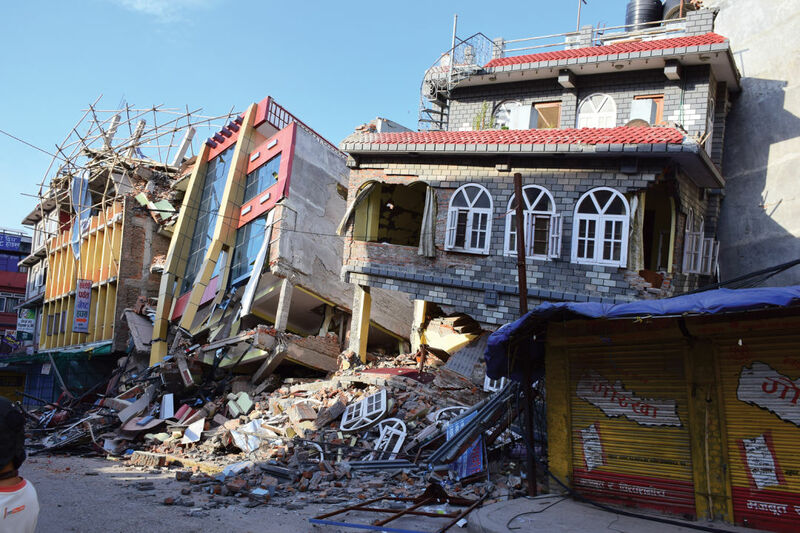 Corresponding via Skype over the months following the second quake, Katie Rose, Dr. Jain, and Dawa and his nephew Samden—Classrooms in the Clouds’ only paid employee—gathered supplies, raised money, and translated health guidelines into Nepalese. And they scraped together enough money to outfit their first Khumbu mission and fund Katie Rose’s return ticket. In September 2015, armed with first aid kits, log books, visual aids, and $60,000 in pro bono tools and services from Embolden Alliances, Katie Rose and Dr. Jain landed in Kathmandu for a second round. But for Katie Rose, the return trip meant more than just the first aid curriculum. That fall, Sandy Hill, one of the clients on Scott Fischer’s ’96 climb, had caught wind of Katie Rose’s plans for Nepal. 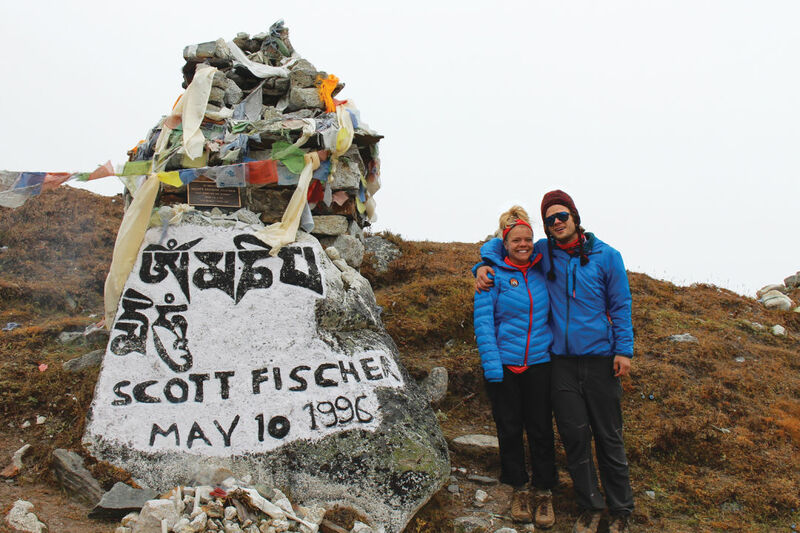 Hill had been one of the most outspoken of Fischer’s supporters, forever connected to Jeannie Price and her children by the life-altering events on Everest. She spearheaded the construction of the late guide’s memorial chorten, and, after hearing about Katie and Andy’s hopes to visit their father’s memorial for the first time, offered to pay for Andy’s plane ticket. As her brother finalized his ticket into Lukla, Katie Rose and her medical outreach team began the trek up the lower Khumbu. Working their way up the steep paths from Sotang, to Bung, and finally on to Lukla, the group witnessed mountains pocked with landslide scars. In town, many homes were rebuilt, but structural skeletons hinted at destruction that continued to haunt the region. Still, the seminars were well attended, with nearly 30 teachers (some from villages as far as a two days’ walk away) at each class. The team went over hygiene techniques (such as hand-washing and food storage) and basic emergency aid protocol. Because of the remoteness of the Sherpa towns, Katie Rose and team adapted their techniques to the unforgiving terrain of the Khumbu. Instead of risking a stretcher on the steep paths around the valley, an effort that could require up to six people and lead to additional injury, the group suggested using a traditional doko basket, adjusting it to carry a person safely downhill. Each participant was then tasked with passing on what they had learned to their home villages, ideally casting a wide net up and down the valley. When Andy met up with Katie Rose in Lukla two weeks later, she and the team had successfully instructed nearly 90 teachers and had their eyes on future programs deeper into the valley. On October 6, 2015, after a short rest at Dawa’s home, Katie Rose and Andy bade farewell to Dawa, Samden, and Dr. Jain and set out on a journey two decades in the making. With the help of Dawa’s brother-in-law, they wound higher and higher up the valley. It was a trek their dad had made routine over the years, but for Katie Rose and Andy, each step came with purpose, moments to savor along hallowed ground. Over seven days they walked from teahouse to teahouse, imagining the many climbers who had tread there before. Back home, Everest was a box-office hit. Katie Rose and Andy had watched the film before their trip, and were unsure how they felt about it. The tight-knit climbing community was more definitive. “They portray [Scott] as some sort of stoner surfer…but that’s not who he was,” says Bishop. “This is one of the strongest high altitude mountaineers of his era…he was a monster.” But as the siblings’ inboxes brimmed with disappointed emails over their dad’s portrayal, they found peace climbing beyond it. Ever since his death, the media had been trying to recreate his life. 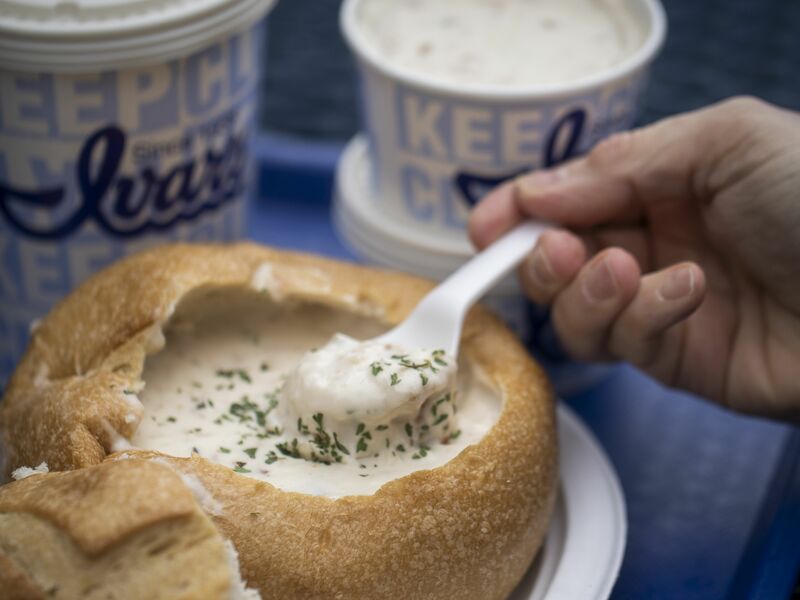 Now they were here—living it. Six days into their journey, on October 12, they reached their father’s chorten amid a cold wind in Dughla Pass. Graced with freshly burned candles, Tibetan prayer flags, and khatas, the traditional Nepali scarves, their dad’s memorial teemed with life. Without warning, Katie Rose’s tears flowed. There had never been a grave site for her dad, no headstone to adorn with flowers every Father’s Day. For the first time, Katie Rose felt like she had a place to honor the man who so often seemed just out of reach. Sitting at the base of the memorial, the siblings talked to Scott. They said how sorry they were they had missed out on him, how sorry they were that he had missed out on them. As they made their peace, a man wandered up to the chorten, catching the red-eyed pair off guard. “I know what you mean,” he said. 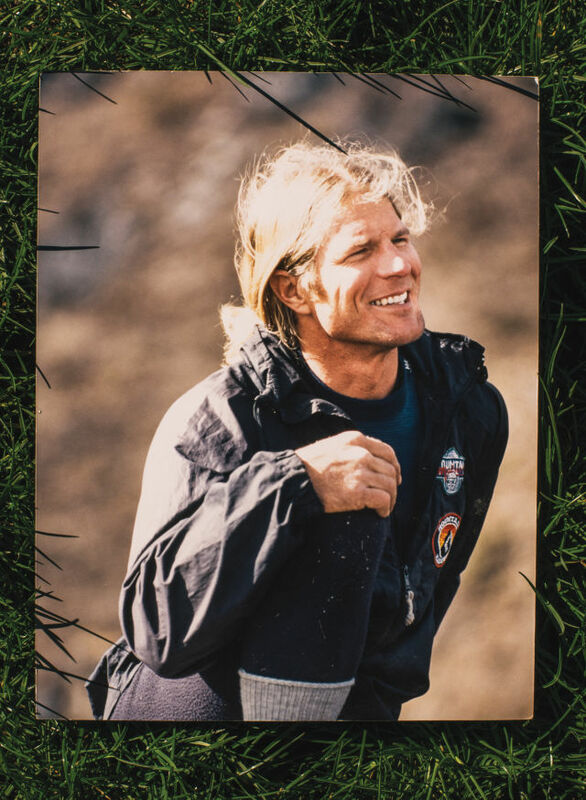 The man, unaware of who his audience was, went on to explain that Scott Fischer and the late Rob Hall had inspired him to make the trek up to base camp, to get healthy, and to turn his life around. Katie Rose and Andy never made it to base camp, opting instead to climb up Kala Patthar, a Himalayan subpeak with unobstructed views of Everest. Scrambling up a steep final pitch, the two got their first view of their dad’s final resting place, 27,000 feet up in the sky. Basking in Scott Fischer’s alpine cathedral, Katie Rose realized that she and her brother might never walk in his footsteps to the tops of the highest peaks. But they had followed those steps to Nepal and, through the vast web of people, stories, and experiences that continue to make the man a legend 20 years after his death, they found their own path. Before turning back, Katie Rose picked out five “dot people,” climbers making their way across a massive snowfield on the Himalayan giant Pumori, next to Everest.